A little light on lighting, anyway. In my little studio I have a lovely window that faces South and another that faces West. Even though the westward one looks out on the covered porch, I have pretty good natural light during the day for general uses. Plus, there's a decent ceiling light in the middle of the 9x12 foot space. But I work on many of my projects at night after the kids go to bed. Daylight is best for taking pictures for the blog and stuff. It would be such a boring blog without pictures. The other main time I work on my quilting and sewing is during our "Quiet Time". Blessed, wonderful, quiet time. Then there is fabulous light in my room unless the weather is awful or very sunny. That southern exposure can be too bright, especially bouncing off my white, high gloss sewing table. Blinding! So the shade is pulled down and then the lighting isn't so great. Today I bought a 3 light floor lamp at Wally World (Walmart) for $25 and a few bulbs. I'm hoping it will help with the photography, at which my skills are awfully basic. I'm not sure about the bulbs yet. I bought 2 'daylight' fluorescent bulbs and used an incandescent that I had sitting around the house. Bulbs have gotten spendy and I need to research what I need before buying any more. I started this project at the shop, so I used the Janome 8200 that is on display. Nice machine! I also worked on a project for the shop. The owner doesn't have an actual "open" sign. He prefers the subtle opening of the window blinds as his 'we're here!' statement. When I mention an open sign, he keeps talking about getting one of those programmable digital signs. I think they're kind of tacky unless it's an electronics store or something. So I made a quilted sign to use for now. I got it halfway quilted, and realized I didn't do the blanket stitch inside the 'P'. I'll fix when I'm up at the shop next. I did finish quilting it. I decided I'd use clear thread to quilt over the decorative stitches I used to machine applique the letters. That didn't work so well with these satin-stitch ovals. But it worked quite well with the star stitch below and the blanket stitch. I loved the blanket stitch I used on this machine. I echo quilted the letters in black and quilted the rest with a variation of the open-S shape design from Monday's post. More linear, with a swirl thrown in here and there. If this was to be a wall hanging, with a child's name instead of OPEN, for instance, I would probably line the letters so the background fabric wouldn't show through. That means to use a double layer of fabric for the applique. Cutting the background fabric is an option, but I fused these letters, so that wasn't going to work here. But this is fine for the purpose. Now that I have some better lighting, I'm looking forward to working on a new project and taking plenty of pictures! I am looking forward to some extra stitching time this weekend. How about you? I am so excited to start this month's Free Motion Monday Quilting Adventure! We're going back to basics and giving some great info to the quilter who is just beginning with free motion quilting. If you are brand new to FMQ, check out my posts How to Free Motion Quilt: The Set Up, How to Free Motion Quilt: Basic Motion and Tension, and How to Free Motion Quilt: The Designs. You can find all three posts and other handy posts on the tab above called, Tips for Free Motion Quilting. This pic was set up to go with the 3 part series above and is my most pinned pic on Pinterest. Be kind to yourself and don't compare your beginning with someone else's middle (A quote attributed to Jon Acuff, I believe). Relax and don't practice on your quilt tops right away, use practice pieces instead. 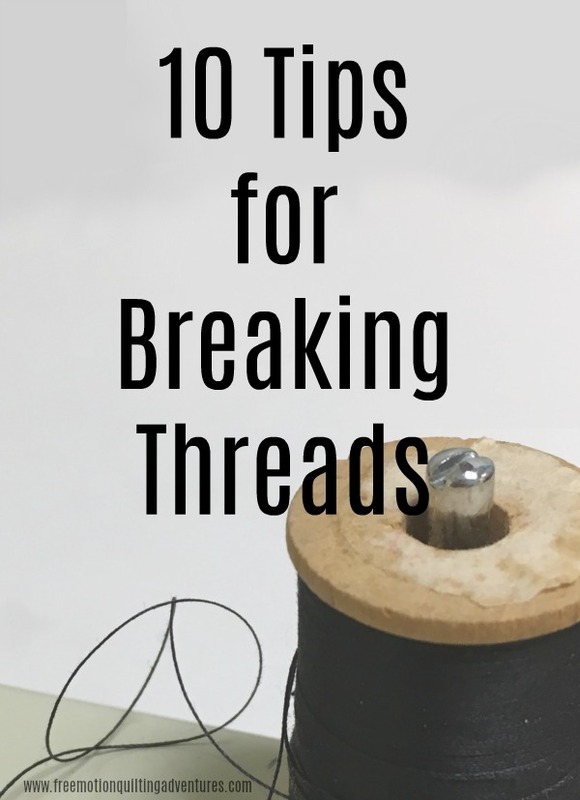 Quilting with a light colored batik on the top of a practice sandwich without thread is a great, waste-free way to practice when you are very new. I'm starting off with loops. These loops are great for beginners as we are all fairly good at doodling circles around and around----meandering (the verb, not the noun, meaning the puzzle like design, got it?) around the open areas. A word about hand positioning. I've been teaching classes in person for nearly two years now. There's something about FMQ that makes people feel like they've got to go crazy fast and avoid stopping. This leads to getting your hands out of position as you quilt or trying to shift your hands while still stitching. Both are a bad idea. Stop and reposition your hands so that they are on either side of the needle. Too far away and you run the risk of the above picture. Below is the misshapen loop that was stitched when the fabric wrinkled as my hands were too far in front of the needle. Don't get your fingers too close to the needle either! Besides risking injury, if your hand runs into the foot, you'll have irregularities in your design. Don't forget to check your thread tension too! Sporadic tension issues can tell you that you are either almost at the tension sweet spot, or that your hand motion is uneven at those spots and throwing the tension off. A slight jerk of the hands can cause a slight jerking in the thread and throw the tension off. I deliberately used a loose tension above, you're seeing the bottom side here. Below, the top tension is too tight, pulling the bobbin thread to the top. 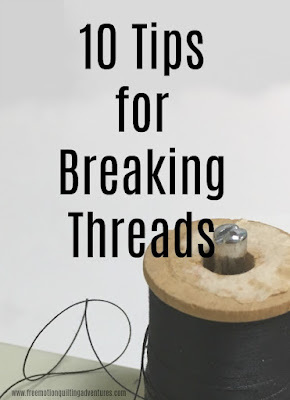 Using two different colors of thread is a great way to figure out tension, but keep in mind that under perfect tension, you may still see slight spots of color showing in the hole where the stitch is formed. Switch to matching thread colors and it will not be an issue. Contracting threads show every mistake so be kind to yourself (and to me, this was done in a hurry). When quilting on a sewing machine, it is pretty easy to stitch small. It can be more of a challenge to stitch larger. Loops can be sized appropriately for different projects and variety can be thrown in with multiple loops in one area, varying the loop sizes, lengthening or shortening the distance between loops. Below, I took advantage of the crossing threads to change my direction. It would have been nearly unnoticeable except I paused too long when changing direction and formed a knot of stitches that pulled up the brown bobbin thread. Below I switched to double loops which is kind of fun. I then alternated between single and double loops. I've recently seen this multiple loop style, like the below pic, on modern quilts but used more uniformly positioned than I have it here. Don't forget pebbles! They're essentially loops all next to each other. Below, the blue line goes between an area of pebbles where I changed the thread tension a bit. Finally, I switched back to simple loops with nearly perfect tension. You can still see the dark brown bobbin thread peeking out of the needle holes and contrasting sharply against the orange top thread. I encourage you to give loops a try if you are new to FMQ and to play with loops if you aren't so new to it. Next week, I'll show you some other simple variations of loops like leaves, hearts and more. Ask questions in the comments and I'll do my best to answer you. Link up a blog post showing your work below and we'll a-go a-visitin'!